I get a lot of emails asking about the test routes I use here in South-East Queensland. We are fortunate to live in one of the most interesting volcanic areas from Australia’s ancient history. The result is a wide range of topographical conditions formed when the Tweed Volcano, a shield volcano, erupted around 23 million years ago in the Miocene period, after Australia broke away from the supercontinent of Gondwana. This makes for great test roads up and over the Barrier Ranges, created after the series of eruptions which then formed the rim of a vast caldera. Now called the ‘Scenic Rim’, it is populated mostly by small towns and villages, and both large and small farms. Twisting between the landmarks over the valley floor of the caldera, are a range of beautiful, challenging roads, which provide a wide variety of driving conditions. 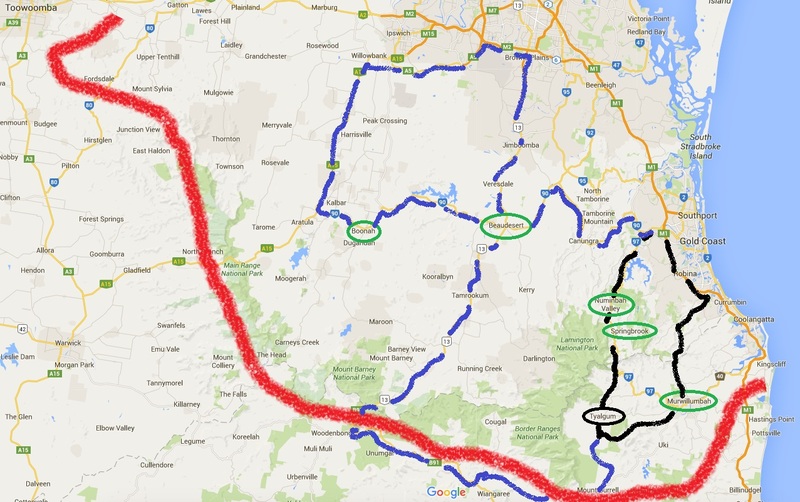 My crude map shows the remaining higher elevations with the red line, and the major towns are circled in green. My favourite test routes are marked in blue and black, but there are many more which criss-cross the area. Most visible remaining volcanic plug, which has resisted erosion, is Mount Warning (1156 metres/3793 ft). The elements of the base of the old volcano which remain and form ‘The Scenic Rim’ and are made up mostly of basalt. The basaltic soil in the caldera is excellent for agriculture, and supports a range of micro climates, and at the mid altitudes there are a number of rainforest areas, boasting many very important botanical species. The original volcano was more than 100 km in diameter, and nearly twice the height of Mount Warning today. The resulting erosion caldera is listed as the largest in the southern hemisphere. 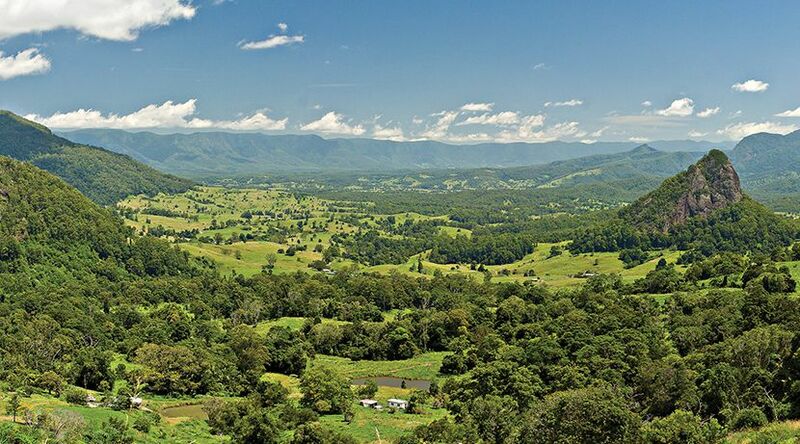 Interestingly, the western side of the scenic rim protects large areas of the plains inside caldera from the violent rain and thunderstorms which often sweep into south east Queensland from the south west. It is not unusual to witness major storms hitting the western side of the rim, and moving north, then north-east to strike the city of Brisbane, leaving the cities and towns of the Gold Coast untouched. The area west of the Gold Coast to the Scenic Rim is known as the Hinterland and adds huge variety in both topography and attractions to complement the beachside community, which stretches 35km south from Southport to the state border of Queensland/New South Wales at Coolangatta.